The twin villages of Town Yetholm and Kirk Yetholm lie either side of the valley of the Bowmont Water and about a quarter of a mile apart. To their east the land rises towards the Cheviots, while the nearest significant settlement is Kelso, some eight miles to the north west. 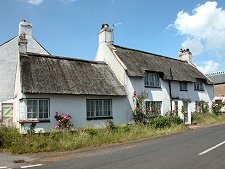 Both villages are highly unusual in Scotland in having a number of thatched cottages and houses, giving an impression more of the Cotswolds than the Cheviots. Yetholm's location is slightly odd for another reason. Most of the valley of the Bowmont Water lies in England, and the border is just a mile or so to the east of Yetholm. Indeed for many years the only road in or out led down the valley into England: and anyone wishing to go to Kelso had to make a detour via Mindrum in Northumberland. 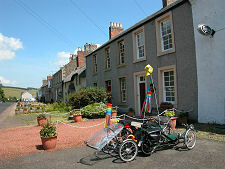 Today it can be reached from Kelso or from Jedburgh via Morebattle. 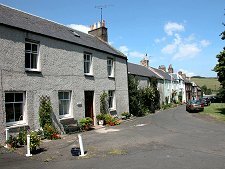 The name Yetholm means "Gate Town", and the villages have been described as lying on the front line during the various wars between England and Scotland. It would probably be more accurate to think of them as being sited in the no-man's-land between the front line trenches. The cross border turbulence meant that permanent settlement in Yetholm may only have started towards the end of the 1500s. However, the area had long been home to the Yetholm Gypsies, who found the border location made travel and avoidance of persecution easier. 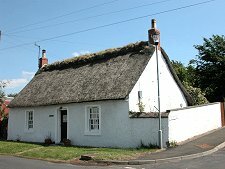 Most of the gypsies settled permanently in Kirk Yetholm when the laird built houses and a school for the community during the 1700s. The last true King of the Gypsies died in Kirk Yetholm in 1883, though in an early attempt to boost the local economy through tourism, a ceremonial Gypsy Coronation took place as late as 1898. 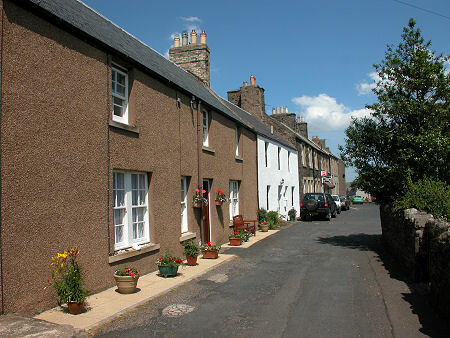 Town Yetholm is built astride the B6352, part of which broadens out into a nicely tree-clad green. 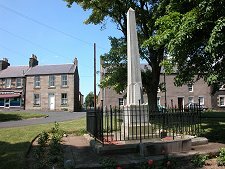 This is home to the Wauchope Memorial, and overlooked by the Plough Hotel. 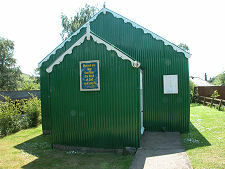 Kirk Yetholm has a much larger and more open village green, on one side of which is the very attractive Border Hotel. 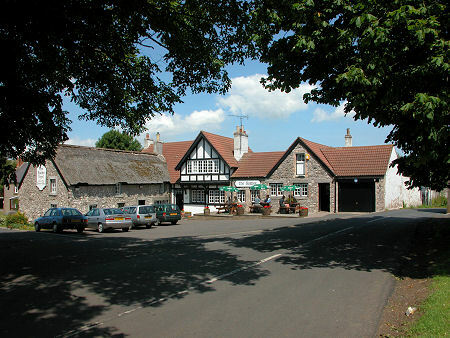 The hotel suffered a serious fire in June 2006 that effectively destroyed the original thatched building that once served as a drovers inn and more recently provided accommodation and the hotel kitchens. 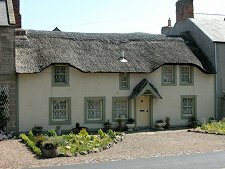 This has since been sympathetically rebuilt, complete with thatched roof. These days, Yetholm is best known for as a centre for walkers. The Pennine Way Long Distance Footpath is generally thought of as an English path: and all but the most northerly couple of miles of it are in England. 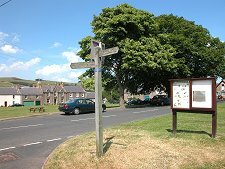 But the Way starts or (more commonly) ends at the Border Hotel in Kirk Yetholm, a mere 268 peaty miles north of its southern terminus in Edale, Derbyshire. 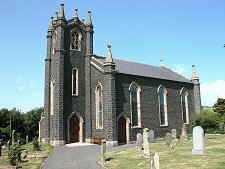 More recently, Kirk Yetholm has also become a feature on the St Cuthbert's Way, a 62 mile walk following in the footsteps of St Cuthbert from Melrose to Lindisfarne. 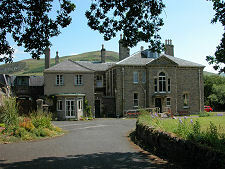 Those travelling St Cuthbert's Way might arrive in the village less wearily than walkers concluding the Pennine Way: but for both groups the Border Hotel is an extremely welcome sight.